MILLIONS of pounds of taxpayers’ money sent to India to educate poor children is falling into the pockets of crooked officials in the country. A News of the World investigation has uncovered corruption on an incredible scale after our Government poured in £340MILLION aid. It went to a multi-billion schools project blasted by Indian inspectors as fraudulent and riddled with malpractice. 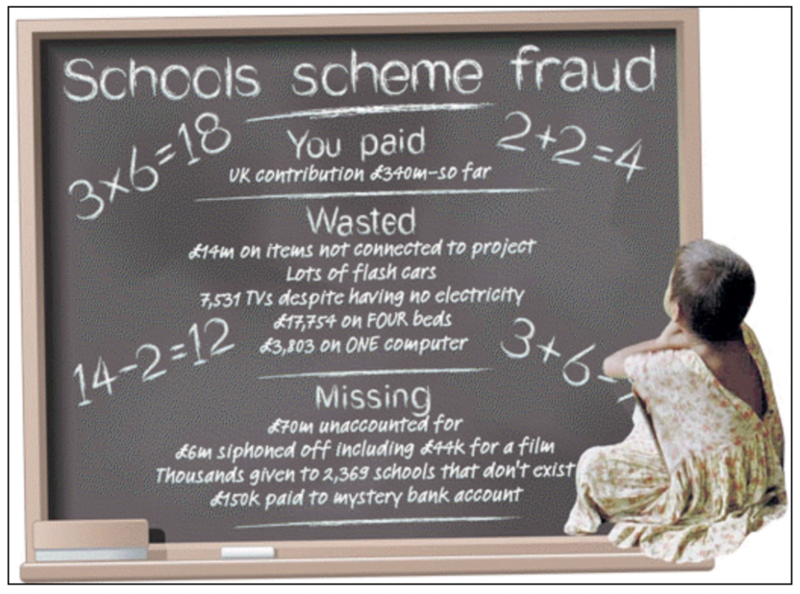 One audit of money earmarked for the Sarva Shiksha Abhiyan project found that £70 MILLION had vanished. Cash has been snaffled by officials running the massive scheme covering schools for India’s 350 million children under 14, according to a report by India’s Human Resource Development Ministry. One report by India’s Auditor General said almost £14million had been spent on items that had nothing to do with schools. Cash meant for kids’ education has been blown on luxuries. We discovered that officials throughout the country had used it to buy NEW CARS and in one instance aid cash was spent on FOUR LUXURY BEDS costing a total of £17,754 as well as a £3,803 computer, AIR CONDITIONERS, FAXES, PHOTOCOPIERS and 7,531 COLOUR TELEVISIONS – the last thing children with no basic sanitation need – have mysteriously been bought for classrooms and offices despite some having NO ELECTRICITY. Tens of thousands of pounds were allocated to 2,369 schools that didn’t even exist and inspectors found that three vast payments earmarked for the flagship project and amounting to £168,000, were unexplained. And £150,000 was paid into a mystery bank account with no reason given. India’s individual 28 states – given millions to educate their children – are also believed to be hanging on to cash to divert it elsewhere. In the Bihar state, a report by the Institute of Public Auditors of India found that children were being taught in open fields, because money had not been passed on for classroom repairs. 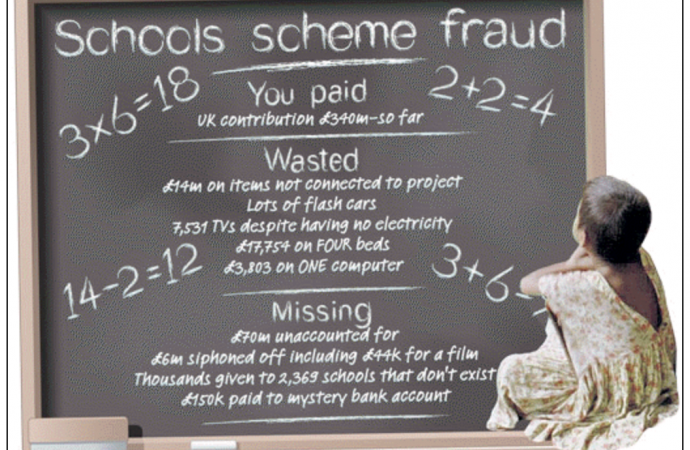 In Muzzaffarpur they found that only £400,000 out of an allocated £1.1million had gone to schools. One woman involved in the widespread fraud has been accused of siphoning off up to £6MILLION from the funds, even using £44,000 of it to make a MOVIE directed by her son. Auditors checking individual state accounts found sums up to £4.8MILLION missing from the books. Despite all this, the British Department for International Development (DfID) had planned to donate millions more to the project in the next three years. But with Chancellor George Osborne preparing to axe up to £60billion of public spending at home – on top of £6billion of cuts already announced – taxpayers might wonder why we continue to give money to a country steeped in such corruption. India is the single largest recipient of UK overseas aid, receiving £1BILLION between 2003 and 2008. Two years ago Gordon Brown cemented that position when he agreed to give the former colony another £825MILLION by 2011. But the Indian economy is already ranked 11th in the world rich list and is predicted to OVERTAKE the British economy as the world’s fifth largest by 2015. Yet still the DfID has poured in general aid – such as £13million to help the government of Bihar state deliver public services and £18million to support local businesses while back home our own small businesses struggle to survive. Last night Andrew Mitchell, Secretary of State for International Development, was stunned by our findings. THESE are shocking allegations and I have launched an immediate inquiry to ensure British aid money has not been misused. When I took up this job a month ago I made a pledge to taxpayers that they must know that for every pound of their money, we will get 100 pence of value. Now I’m reviewing every single one of the Department for International Development’s country programmes to ensure we are giving aid to where it’s most needed – to help the world’s poorest people. But I want to go much further. This is why last week I announced a new independent aid watchdog – to scrutinise aid on the taxpayers’ behalf. In future we will also publish all details of the department’s spending on our website.